ALTHOUGH Castletown is the real capital, Douglas is the principal seaside town, and deservedly the most popular in the Isle of Man. Douglas can be easily reached from any centre in England or Ire. land, as the steamers run from Liverpool, Whitehaven, Barrow, Fleetwood, and Dublin. During the summer season the cost of transit may be considerably reduced by taking tourist tickets. By no means the least enjoyable part of a trip to Douglas is the sea voyage of about five and a half hours from Liverpool, and much less from Whitehaven, Barrow, or Fleetwood. The island is seen to advantage as you steam into the fine bay on which Douglas stands. Here every convenience for enjoyment may be found, and, combined with a pure, bracing air, and grand sea and scenery, no one can help being delighted with the island. There are fine piers stretching out into the bay, and boats can be hired very reasonably. Fine bathing is to be obtained at Port Skillion, where there is a bathing jetty, from which one may dive into twenty-seven feet of clear water. This creek is suitable for swimmers only. The sea-fishing is very good throughout the season. There are plenty of donkeys, ponies, horses, and vehicles of every description. Something is going on in Douglas nearly all the summer, either companies at its three theatres, or concerts, and the usual promenades, accompanied by a good band. In the summer months steamers make excursions round the island, and sometimes to Scotland and Ireland. Bathing cannot be too highly praised here, as there is a firm, sandy shore, beautifully clear water, and plenty of machines ; yachts and craft of all kinds are plentiful, and mackerel and herring fishing is good. There are good shops in Douglas, and things are all reasonable, some being much cheaper than in England. June is a pleasant month to visit the Isle of Man, but as so many English towns have their wakes, fairs, and holidays about this time, and the multitudes who then throng the place are not always of the most refined class, it has its drawbacks. Excursions may be made all over the island, and the following ought never to be omitted: there is the ascent of Snae Fell (the highest point of Mona), whence a fine view of the island and generally the mountains of South Scotland, Cumberland, and Ireland. It is only about eight miles from Douglas. Rhenass, in Glen Helen, is a fine waterfall, and the glens in Meay, Sulby, the Dhoon, &c., abound in most romantic and picturesque scenery, with hills on either side, wooded with larches, and brawling streams at the base, and affording splendid places for picnics. The drive from Douglas is very pretty, passing the nunnery and the old church of Kirk Braddon, the churchyard of which contains some very ancient Runic monuments. Peel is not far from Glen Helen, and is celebrated for its herring fisheries and its castle. Laxey is about eight miles from Douglas, and can either be reached by a good row round the coast, or a drive ; it has a remarkable waterwheel (said to be the largest in the world), connected with the great Laxey lead mines. Near Laxey is the burial-place of the renowned King Orry. Castletown is in the south of the island, and is a very quiet old place, where the castle (the prison of the island), which was defended by the celebrated Countess of Derby, will interest every one. The House of Keys (the Manx Parliament) formerly met in Castletown, but now sits at Douglas. To the south of Castletown lies the Calf of Man, and some very grand rocky coasts, a part of which, known as the Chasms, is within an easy walk from Port Erin, and is well worth a visit. Near Castletown is the celebrated King William's College-a first-class school, large and efficient. The coast near and south of Douglas is all very rocky, and by hiring a boat many pretty little creeks and coves may be explored. Douglas has some splendid hotels, of which the Castle Mona is one of the first, standing just out of the town, in its own grounds, which are beautifully wooded, and facing the sea; the Fort Anne Hotel has a lofty situation, being to the left of the bay on entering, and is largely patronised. Besides these two there are the Peveril, the Granville, Villiers, Athol, Sun, Grand, Regent, and Falcon-all new, and of a high order; the Royal, on the quay, and several smaller ones, and numbers of boarding-houses and private apartments. Of the boarding-houses, the Clarence is one of the best, both for its situation and economy. House agents, Mr. F. S. Jackson and Mr. E. Robertson, both of Athol Street, and Mr. Sutherland. The principal booksellers are Messrs. Mylrea & Allen, the Times and Herald newspaper offices. 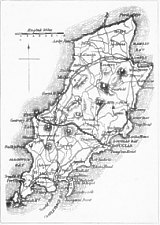 SITUATED on the north-eastern side of the island, Ramsey has a level, sandy beach, closed at one end by picturesque rocks, and extending on the other far beyond the Point of Ayr, skirted all the way by sandy cliffs covered with gorse, fern, and moss-like grass, and interspersed with harebells and other flowers-a very paradise for children, where, in perfect safety, they may enjoy all desirable seaside pleasures. The water all round the island is perfectly clear, the shore, near Ramsey, being without any holes or quicksands. The neighbourhood abounds in shady, secluded glens, through which little streams dash along their rocky beds, often forming beautiful cascades fringed with ferns and pendent foliage. Since the Isle of Man Steam Packet Company has added several first-class vessels to its fleet, the island is easily accessible from Liverpool, Whitehaven, Barrow, Fleetwood, Dublin, Belfast, and Glasgow. A vessel leaves Liverpool at noon direct to Ramsey on Mondays and, via Douglas, on Fridays, and another from Whitehaven every fortnight. A great advantage to the north of the island, especially Ramsey, is the railway which has recently been opened between Ramsey and Douglas; visitors preferring to go via Douglas can now do so daily, as the train waits the arrival of the boats every evening. This part of the railway being opened, completes the communication between the four principal towns, Douglas, Peel, Ramsey, and Castletown. A train also leaves Ramsey every morning (Sundays excepted) which arrives in Douglas in time to catch the morning boats to Liverpool or Barrow. The coaches between Ramsey and Douglas via Laxey are fairly well patronised during the summer. Ramsey is a rising town of more than 4,000 inhabitants. The little river Sulby divides it into two parts, entering the bay by an excellent harbour, with two piers, one of which joins a promenade, whence there is a very animated, though quiet, prospect by sea and land-the bay studded with fishing and pleasure boats, and large vessels passing along the Irish Sea. Provisions are cheaper than in England. Sea fish of all sorts is abundant and good, and easily caught, even by amateurs. Trout and salmon are taken in several of the little Manx rivers. The great attractions of Ramsey are its lovely walks in scenery still in all its original wildness. But for those who seek the 'life' which shows itself in theatres, music-halls, dancing-rooms, &c., Ramsey is the wrong place. There are three churches and many Dissenting places of worship ; and as public-houses are closed on Sundays it has a very quiet Sabbath. There is a good grammar school. The Runic monuments are very perfect, and are found scattered all over the island, as well as many ancient ecclesiastical structures which well reward the antiquary. The geology of the island is very rich and varied, as are also the seaweeds. Ferns abound in the glens, and a few botanical rarities are to be found on the mountains and bogs, and many a zoological curiosity may be got by dredging from boats, while the artist will find exquisite scenery of great variety. Most of the peasantry can speak English. Excellent carriages can be hired at moderate charges, so that all the objects of interest can be seen cheaply and easily. There is telegraphic communication. The town commands a view of the entire bay, beyond which are now and then seen the faint blue hills of Cumberland and Scotland. Just behind the town is a range of hills, ending in the east in the grand cliffs of Maugold Head, and extending into the centre of the island, so as to include Snaefell, Barrule, and other famous points, the whole forming a grand panorama, especially when lighted by the golden sunset or sunrise. As Snaefell is above, and Barrule not much less than, 2,000 feet high, the views from their summits are very fine, England, Scotland, Ireland, and Wales being often visible. These hills are within a moderate walk-and, indeed, within five miles of Ramsey are many scenes of great beauty, especially the glens and wood-walks at the base of the hills. The Mitre (which is the principal hotel in the town), the Albert, the Prince of Wales, and the Royal, are the best hotels, and there are several others. Good lodging-houses, although neither grand nor showy, are fairly plentiful. Lodgings are abundant, but if the visitors' party is large, notice should be given beforehand. Entire houses are also let at very moderate rates, especially if taken for two or three months. The principal house agents are Mr. J. J. Corlett and Messrs. Boyde ; information will be readily given also by Mr. Crane, bookseller. PEEL is twelve miles from Douglas. It is the most important fishing town or village in the island. There are about 200 boats and 1,600 men and boys engaged in the fisheries. Some of the chief attractions of Peel are the renowned castle and cathedral of Sodor and Man, which are visited by many thousands of tourists in the season. The bay and neighbourhood of Peel are very pretty and interesting, and the setting of the sun as seen from Peel is very remarkable, and forms quite an attraction. For means of access, see Ramsey. The celebrated Glenmaye Waterfalls and Nairbyl Bay are situate about three miles from Peel, and the walk round the coast is very interesting. Like Port Erin, the district provides subjects for the numerous artists who visit Peel and neighbourhood. Very extensive harbour works and improvements are now being proceeded with to give better accommodation for the fishing fleet, &c. The Duke of Edinburgh visited Peel on January 31, 1882, and was much pleased with the general appearance of the place and fishing fleet. The hotels which make preparation for the refreshment of visitors are Peel Castle Hotel, Royal Hotel, and Fenella Hotel. ALMOST at the extreme south of the Isle of Man, fifteen miles by rail or road from Douglas and five from Castletown, stands the pretty little village of Port Erin. The bay reminds one somewhat of a horseshoe magnet, the red sealing-wax of the latter representing the houses; it is bordered on the right by Bradda Head, whose rocky sides sink perpendicularly into the sea, on the left by the Cassels, and above them the Hills of Mull. For means of access, see Ramsey. Port Erin being situated on the western shores of the island, and sheltered from all winds but the exhilarating western breezes, enjoys a climate almost unrivalled in the United Kingdom. Frosts are rare, and snow is almost unknown. Plenty of good sailing and rowing boats may be obtained at very reasonable rates. Further amusement can be had from billiards and lawn-tennis, and there is also a skating-rink. A breakwater has recently been built partially across the bay, at a cost of 80,0001., but there is extremely little to be seen for the money. The headlands around are bold and precipitous, and the water at their base is of great depth. As the currents are very strong, swimmers ignorant of the locality must beware of bathing outside the breakwater. Great improvements have lately been made to meet the advancing popularity of this rising place. There is now a good supply of water, and the drainage of the whole village is under the control of the sanitary authorities, who have laid down a system of new drainage pipes. Several new houses have been erected, and a new hotel built. The Calf of Man, a small island of considerable grandeur and beauty, which lies three miles away to the south, is well worth a visit. The view on a fine day is very extensive, and the Irish hills can be plainly distinguished. For the naturalist the neighbourhood possesses many objects of interest, as the coast is the home of sea birds of almost every possible species. The sportsman fond of fishing can indulge in his favourite sport day or night to his heart's content, nor will he have any cause to grumble at his luck. The principal kinds of fish are whiting, mackerel, cod, conger, gurnet, plaice, and skate. The geologist, also, will find it a fruitful field for his labours, the formation is exceedingly curious, and there are many interesting eaves; while about three miles distant lie the Chasms, deep fissures caused by the upheaval at some remote period of the earth's crust. Even the antiquarian will be rewarded by a visit, as close to the village stands a remarkable tumulus where a battle was fought, and concerning which there has been much wordy warfare. There are two excellent hotels, the Falcon's Nest and the Villa Marina ; the new one is called the Belle Vue.